← Five “free” nights at Conchas Lake! A familiar place, a familiar face, and a tarantula! Goodbye, Conchas Lake . . . Studying the map I realize the most efficient and economical route westward toward Albuquerque from Conchas Lake is to drive south to Newkirk and get on interstate 40 west. That means stopping at Santa Rosa State Park again. I want a different campground, one we haven’t been to before. Oh well, it looks like Santa Rosa is the only good choice. It’s a short trip so we leave around noon in order to avoid an early arrival. It’s Sunday and I want to give weekend campers time to leave, opening up some campsites with electric hook-up. My computer and phone need to be recharged. Driving down the ramp into Santa Rosa, my reaction surprises me. How nice it is to return to the familiar! There’s the laundromat I used before and up ahead I see the T & D Market. It’s open on Sunday! I stop for supplies . . . milk, bread, eggs. Moving on I look for the turn at the Comet Restaurant. I see a flash of blue to the left — the Blue Hole – and have to smile recalling Spike’s impulsive swim. So this is what it’ll be like. After some time on the road, I’ll return to previous camps and feel the comfort of familiarity. That’s a good thing. There’s something to be said for knowing where you’re going. The first campsite is available and has electric, so I grab it. As usual . . . Spike is relaxed and Bridget is wondering what's going to happen next. It happens to be next to the site we stayed at last time. After backing in I get a big wave from a couple entering the park towing a Casita, a 17-footer like mine. They stop in the road and I go over for a brief chat. They announce excitedly, “We’re on our way to see the Grand Canyon!” Their Casita is a 2010 which they bought from someone who had it only six months. “Hmmm. Good deal,” I say and the man nods, smiling. Even before I can hook up, the crew insists on a walk. 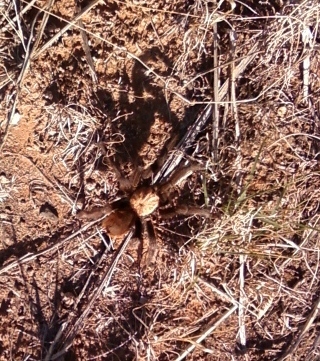 Can you see the tarantula that scurried across our path? Shortly after our return there’s a knock at the door. I immediately recognize Peggy, the lady who parked next to me at Storrie Lake. She drives a Class A (bus type) and has been fulltiming, off and on, for several years. I invite her in and we have no trouble finding subjects to discuss. The crew listens quietly, but after about three hours, Spike can’t take it anymore! So we walk the crew together. Reaching her campsite, she invites me in for a tour. How spacious her rv is compared to my Casita! Back at the Casita, I feed the crew and myself, and get online! It seems like a long time since I last saw rvsue and her canine crew. I read the comments and write replies. I work on the entry about our stay at Conchas Lake. 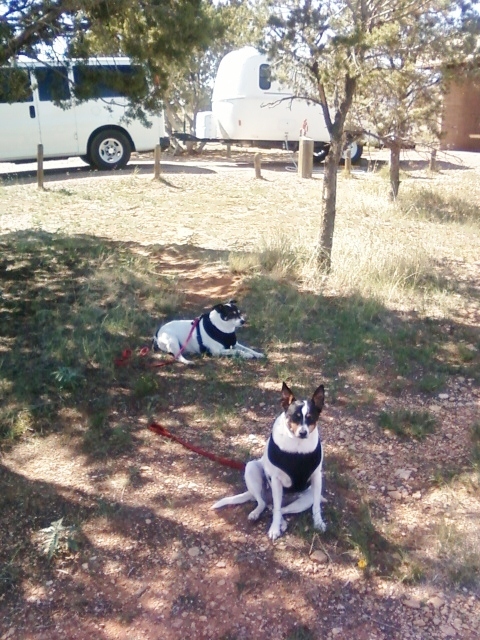 This entry was posted in Simple living and tagged casita, Conchas Lake, fulltiming, nature, New Mexico, Santa Rosa, tarantula, Travel. Bookmark the permalink. 9 Responses to A familiar place, a familiar face, and a tarantula! Loving the updates!!! I hope you guys are getting a chance to really soak in each of your stops. Oh yeah, we’re definitely not in the fast lane! “How nice it is to return to the familiar! ” New places are really nice but sometimes it’s great to go where you’re reasonably sure there won’t be unpleasant “surprises”, especially if it’s on the way. “How spacious her rv is compared to my Casita!” but I bet you don’t regret choosing the Casita one bit. After the long hauls last month, isn’t it nice to take a short, leisurely drive and get to the next campground? I am absolutely happy with my Casita. Class As are great, but if you want a car, you have to drag one behind. Two enormous . . . and I mean ENORMOUS . . . Class As pulled in here nearby. I tried to get a photo of one along with the Casita, but there’s too much distance. It would have made a funny pic. Yes, I like short drives. It’s easier on the crew and the day is more enjoyable. I’m not putting myself under pressure unless absolutely necessary! Glad to see your back w/internet and keeping us followers updated. Looks like the crew are snuggling in just fine with their new fulltiming life. Enjoy the evening. Thanks, Carmen. You enjoy your evening, too. EWWW! Tarantulas! Yes, they are just part of God’s creation but I don’t think I want to encounter one. Years ago when I was a teller supervisor at a local bank, we had a customer that had a pet tarantula. He liked to bring it in and scare the tellers, and was quite obnoxious about it. After several polite requests to leave the tarantula at home, I finally told him if he insisted on bringing it everywhere with him, he just might want to find another bank. Cute picture of your crew. Shows their different personalities. Some people use things like tarantulas or snakes to make themselves feel like they have power over others. It’s okay to have these creatures for pets. It’s not okay to use them to prey upon people’s skittishness or painful phobias. You did the right thing getting rid of him. I have a cute crew. I admit it. I have my share of phobia about creepy, crawly things. I don’t know why but tarantulas don’t bother me. Maybe because they’re furry? Who knows . . . it’s a totally irrational thing. Yeah, I’ve heard about scorpions. Not fun.